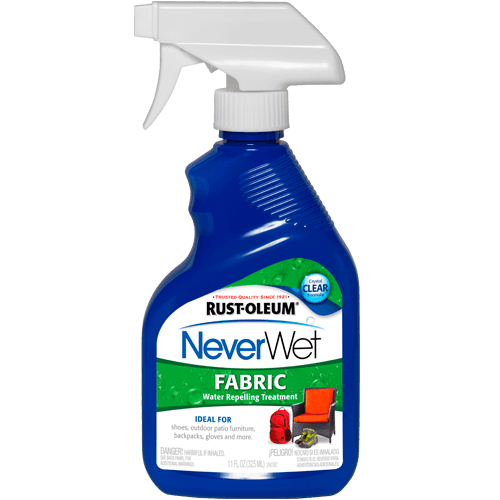 I imagine that there are a number of HS owners here that, like me, have seen the videos posted on YouTube and at Home Depot’s website promoting the new Rustoleum Neverwet product. As I understand it, the actual chemical formula has been around a couple of years, but it took a while for the small team that created it to find a distribution partner and work out the bugs. As sold, Neverwet is a two-part spray. A basecoat (with a 30 minute dry time between coats) and a topcoat (2 minutes between coats). It sounds like the more coats you put down, the more durable the coating is. The downside of additional coats is that you can really feel and see a thick coat. It’s kind of a textured, rubbery feeling, not terrible on the bags for example, but could be unpleasant on a shirt or hat maybe. I took an hour or so to do a 2x base and 2x topcoat application. After another hour of drying time, I uncovered a few good and bad points about the product. The good: It absolutely works as promised. It’s hilariously fun to pour water on the bags and watch the drops literally fly off, leaving zero trace of dampness. Water just cannot touch anything coated with this stuff. The bad: The are upfront about the fact that the coating is not clear once dried, but rather a milky, frosted appearance. They tell you straight up not to coat clear things that you want to see through, for example. But the killer for me, and why I took the time to remove the product, is that the black fabric of the bags, with a milky white coating, gives a blueish appearance. I’m not so particular that this could be unacceptable for me if it were subtle, but in contrast with the grayish black seat, the effect was extremely noticeable. Worse, because it’s difficult to be perfectly even with the application, the result was that the blue appearance was mottled , and most noticeable around handles and edges. It was too bad to keep on, in my opinion. I didn’t get pictures, but you can get the idea from this person’s review of an application on his gloves. Somewhere in the documentation, the manufacturer mentions working on a version of this stuff that dries clear. When that’s out, I’ll try again. And to be clear, I have no problem using the product on light colored things, or on things where I just don’t care about the appearance. And also, to be fair, maybe I could have done much thinner coats, but the glove video shows I’m not alone seeing the color change. The issue with the bags is the zips. The shell is actually a plastic clam shell covered in fabric so its waterproof. Why would even bother trying this with a pair of gloves that are not water resistant? Hard to believe, but this stuff made the zips repel water so efficiently that nothing got through even after pouring a couple of quarts directly on the exposed zipper. Since I got my bike I have been doing one coat a day of 3M Scotchguard. I have noticed no color change, as well we haven't had rain for me to test as well. One can is designed for a sofa, so a few good coats to make sure there all covered should do. I'll report ASAP if and when we see rain again. good idea, Fire. But, I scrub mine with bit of soap every once in a while when they get really nasty. Remember, if they fail within 24 months --> new bags under warranty. I use mine almost daily and load them up. I'm happy with water proofing but the zipper seams are starting to stretch quite a bit. The color fade is more noticeable with polarized lenses but overall, I think they are a solid stock product. The problem will be if the aftermarket doesn't adapt to the Strada's mounting arms. I would consider hard luggage upgrade but really don't want to mount a whole new bracket. One option would be to find hard bags that suit and remount the HS bits from the OE bags. Just riveted on as far as i can see. Imma fit my MS top box shortly and would love hard bags that match. I had the hepco becker panniers on my hypermotard evo. I overloaded them and travelled at high speed constantly. Less than 6 months, the zippers and the stitching shows sign of stretch and starting to wear out. It is very important that you dont overload the type of zipper panniers. Unlike those hard cases whereby max load advice is just a guidance. It doesnt seem to be the case for the zipper type panniers. Why not apply it on the inside? I took delivery of my Strada last week and the rain started today, so I'm looking for a solution. Do you think it may work? If the Neverwet is on the inside, it probably does not matter if it looks bad. The newer version is Never Wet Outdoor Fabric and it works great. Perfectly clear. I have sprayed this product on my side cases. Since the cases have never been used yet, I can't confirm performance. That said, the glass and leather Never Wet products have performed very well. Last edited by RSL; November 7th, 2017 at 05:28 PM.